Aaah, knitting weather! It's been a good time to finish things, what with the hiatus between projects that I'm in at the moment. 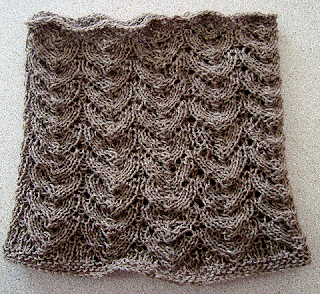 Here's my Good Luck Cowl. 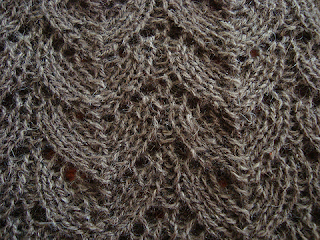 Knit with qiviut (musk ox), kindly sent to me by Abbey! I cast this on for Knitting Camp in late April, and finished it a few nights ago, just in time for some really cold weather. 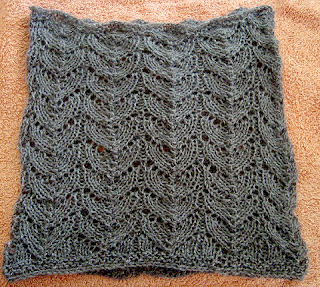 Here's its Ravelry project page. The qiviut really is beautifully soft and super warm! Are you surprised to hear that Petal likes to snuggle in to it, too? ooh didn't it turn out beautifully! mmmm qiviut! Yummy! And beautiful work! I've only seen brown quiviut. You scored big time with that one! Lovely, glad you will get plenty of use from it too, since the winter is now finally wintry! how lovely. That qiviut is really special. It looks wonderful - and just in time for the cold cold weather!